Bio: Our entire 46 years together, Marti and I have always wanted to travel and see what’s over the next hill. When we were young, we spent many days just driving and walking around the countryside. When our sons were born they learned at a tender age to watch the world going by the van windows. They entertained themselves playing in streams, poking about in the woods or over rocks as we wondered about, Ed usually photographing the beauty around us. One of our other long shared dreams was to design and build a home which we finally did, moving into our Whack-A-Mole Farm the spring of 2004. After 10 years however we were becoming physically and mentally tired of maintaining 12 acres with too many flower gardens and too much house, even though it allowed us the delight of seeing our “baby” Kevin married in the front yard to a girl we adore. There was also the ever present emotional exhaustion of having buried our oldest, Scott, at Arlington National Cemetery in August of 2007. We needed a change; a big one and so with Kevin’s blessing we fulfilled that other long shared dream. 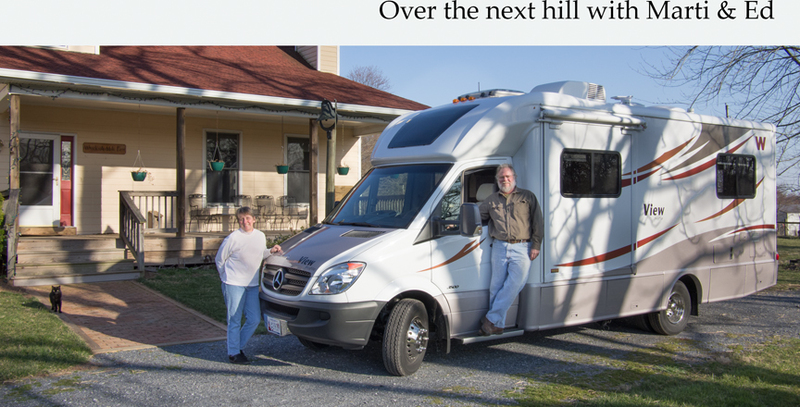 Selling the home we loved we moved into a new 25 ft. Winnebago View Profile motorhome, hitting the road full time in November of 2014. Many of our friends asked how they were going to know where we were, what we were seeing and how they would be able to see the photographs they knew Ed would be shooting, and hence Whack-A-Mole Wheels the blog! We hope you enjoy following along on our great adventure and will stop by and say hello if you should see us on the road. I heard about you from our neighbor, Rob Wells. We have a 1961 converted Greyhound bus we travel in, not full-time though. Would love to follow your travels and I also love photography. If you are interested, my husband John Matthews posts videos on YouTube of our travels and his repair jobs. His name is John Matthews and our bus is “Strayhound ”. Welcome Ginny! Glad to have you along and please say Hi! to Rob and Wendy for us. Maybe we will see you on the road someday. Look for our pink flamingos on the side of our rig.